Are you tired of getting rejection slips? Do you have enough of them to wallpaper a room? Do you wish you could talk to other writers who could tell you what is wrong with this sentence or that chapter? Would you like FREE feedback before you send your manuscript to the editor so that you can increase your chances of getting a check rather than that awful rejection slip? If you answered yes to these questions, you need a writers' critique group, and what better way to get into one than to start one yourself? Whether you are a beginning writer or an expert, a critique group can help you refine the subtleties of plot and characterization, ensure your characters are believable, discover what to cut and what not to cut, and guarantee your article leads and closes are the best possible. Having help in identifying the rough spots in your writing before an editor sees it can mean the difference between receiving a rejection slip or making a sale. Doesn't every writer want the best possible version of his or her work landing on the editor's desk? 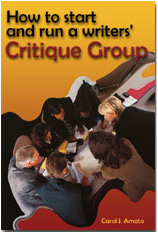 A critique group stimulates your imagination and provides a support group to help you grow.